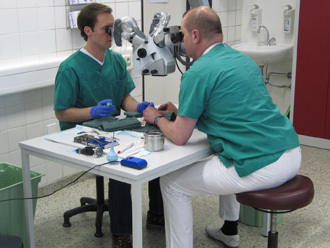 This five-day course is held either at the Johann-Wolfgang-Goethe University-Hospital, in Frankfurt am Main, Germany or in Groningen, The Netherlands (more information to be shared soon) under the direction/instruction of Dr. Gustavo Pérez-Abadía, Assistant Professor of Physiology, University of Louisville, Kentucky, USA. The course runs from 9:00AM to 4:00PM, Monday through Friday and trains a maximum of five trainees at a time. 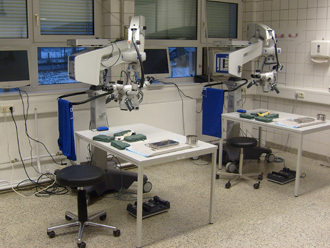 home / Instruction / Teaching Facility top Copyright © International Microsurgery Teaching Course. All rights reserved.